Good news: That house or apartment you’ve been ogling online (or making a detour to pass on your way to work) is yours at long last. But now the specter of filling your space with all the necessities may be looming large—if not quite as large as the price of the whole furnishing and decorating endeavor. Luckily, we are here to help. While we are big fans of the beautifully designed one-off, we recognize (from extensive—and ongoing—personal experience) that those kinds of purchases are not always economical. That’s why we’re bringing you this brief guide to buying quality items at retailers from—yes—Ikea to Target, West Elm, and more. Here now, where to buy key items for every room in your new home, from the kitchen to the bedroom, bathroom, and, ahem, beyond. The Norsborg sofa, seen here in Finnsta dark grey with metal legs. The Sweden-based global furnishings and home goods powerhouse is a beloved brand in the States, and is often a one-stop shop for folks looking to fill their homes quickly and on the cheap. But it can be difficult to sift through all that’s on offer at a place like Ikea and zero in on what’s worth buying. A certain Pinterest fave, the Råskog utility cart ($24.99), which can be used in the kitchen, as a bedside table, and elsewhere, comes highly recommended. We also like Ikea as a sofa source but—pro tip!—spring for the metal legs (a fellow editor swears by this). They wear better over time and lend your seating a modern, streamlined look. May we recommend the Norsborg sofa ($599) in a neutral dark gray? And don’t sleep on the Malm series ($159-$369), your go-to for unobtrusive, low-slung bed frames and headboards. It was perhaps Oprah that raised the profile of Target when she famously called pronounced it the French way, Tar-zhay, on her talk show. But Target has long been a source of stylish staples, thanks in part to design collaborations, for which Target has garnered plenty of attention lately (Marimekko anyone?). There is, of course, the Waffle Weave shower curtain ($28.49), which you’ll find in bathrooms from coast to coast, but Target is also a good place for rugs that can take a beating in your kitchen or outdoor space. The Safavieh Serena Rug starts at $25.99. JCPenney, like Target, also collaborates with well-known designers, like the United Kingdom’s Terence Conran and London fashion designer Duro Olowu. Though JCPenney’s stellar Conran Collection is, sadly, no more, you can still snag a few quality must-haves there, including sheet sets (the Royal Velvet Wrinkle Guard set, which starts at $69.99), cookware, and more. JCPenney also offers a slew of couches—if you’re looking for something inexpensive and hard-wearing in pet and kid-friendly microsuede. Ah, West Elm. The brand is known for being a chicer alternative to some other mass market brands, and a less expensive option for fans of the clean lines of midcentury modern design. Though it offers home goods at every scale, the flat-weave rugs are a sure bet, like the Torres Wool Kilim rug, which starts at $169. If you’re looking for a dresser that lasts longer than a year, don’t settle for particleboard. The bulk of West Elm’s sturdy dressers run less than $1,000 and are frequently on sale. Martha Stewart, goddess of all things home, has a self-titled collection at Macy’s. The line, which includes bedding, rugs, cookware, and more, is available online, too. We’re especially fond of the quick dry reversible bath towels, which come in a slew of colors and start at $2.99 (on sale). And for something midcentury-inspired, try the highly rated Braylei sofa with button tufting currently on sale for $599 (originally $699). Max Lamb’s Last stool, $183.20. Online home goods company Hem offers furniture, accessories, rugs, and lighting, in a range of prices. 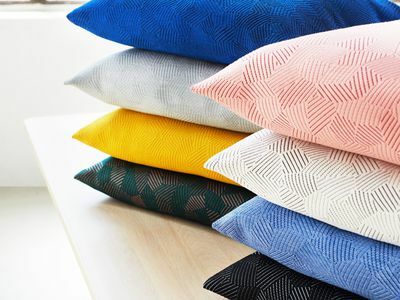 But for high-design on the (relatively) cheap, look no further than Hem’s throw pillows and blankets (starting at $39.20). Hem frequently produces new products in collaboration with first-class designers, like Sylvain Willenz, who worked on textile designs for the company, and Max Lamb, whose Last Stool ($183.20) is a popular buy. Bed Bath & Beyond is chock full of low-priced goods for pretty much every room in your home, as its name promises. But perhaps its most enticing deals are for your kitchen. There isn’t an OXO brand kitchen accessories Bed Bath & Beyond doesn’t offer, and we are partial to the brand for crucial must-haves like vegetable peelers (a three-piece set is $14.99), box graters ($17.99), drain catches, and more. Another great get at Bed Bath & Beyond is anything from its deep roster of storage solutions, especially shelving. Modular pieces, like the Honey-Can-Do Brushed Steel 6-Tier Shelving Unit ($139.99), are particularly useful in storage-starved spaces (city slickers, we’re looking at you). Modern Boho Platform Bed Frame. Surprise! Urban Outfitters—yes, that Urban Outfitters—is now among the best places for scoring modern and whimsical home goods that are also reasonably priced. Having recently expanded its homewares to all stores, the Philadelphia-based company offers everything from furniture to bedding to lighting and all manner of small goods. You can find a collection of unique rugs, like the Tufted Pom Pom Rug (starting at $39) and Cassadaga Tufted Shag Rug (starting at $269) options. On the furniture front, the Morey Platform Bed is an upgrade from Ikea’s Malm ($499.99 for a king), as is the architectural Modern Boho Platform Bed Frame ($1,299 for a queen).